Did you ever receive someone's Jet Report only to find they hard coded in a data source with a different data source name than you used? Let's say your data source name was 2016 NAV and they used NAV2016. 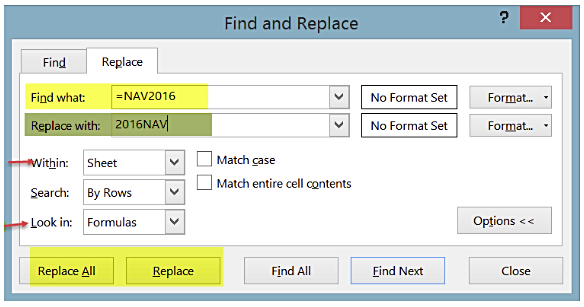 Instead of having to amend each formula manually, let Excel do it for you by using the Find & Replace feature. It's located at the very end on the default setup of the Home ribbon in Find & Select (in Excel 2013). If you have more than one worksheet, you can change the default setting in "Within" to Workbook. By default, "Look in" is set to Formulas, but you can also select Value or Comments. Watch the Excel Magic Trick video below to learn other ways to use this feature.